This article is about the administrative region in Greece. For other uses, see Macedonia (disambiguation). The region of Western Macedonia is situated in north-western Greece, bordering with the regions of Central Macedonia (east), Thessaly (south), Epirus (west), and bounded to the north at the international borders of Greece with the Republic of North Macedonia (Bitola region) and Albania (Korçë County). Although it covers a total surface of 9,451 km2 (3,649 sq mi) (7.2% of country’s total), it has a total population of 283,689 inhabitants (2.6% of the country’s total), thus it is a low-density populated region (30 per km², as compared to the country’s 81.96 per km² average). This is mainly due to the mountainous nature of the region, as 82% of the total surface are mountainous and semi-mountainous areas. This is also reflected in the population distribution, as a majority of the population (56%) lives in rural areas. The capital of the region is Kozani with 53,880 inhabitants. Other main towns are Ptolemaida (37,289), Grevena (17,610), Florina (19,985) and Kastoria (16,958). The map of Western Macedonia region. The Region has one operational Industrial Area in Florina and another one under construction in Kozani. The secondary sector is very important for the Regional economy, mainly due to the mining activities, the production of electric power (70% of country’s total power is produced in the Region) and the fur-leather sector. However, “soft” structures have not followed the general improvement of heavy infrastructures, a situation that has to be remedied, in order to achieve an overall higher economic development of the Region. The R&D services are at a rather low level: only 3,5% of the country’s total research foundations are situated in the Region. Among them, the Technological Educational Institute plays an important role in supporting the regional research and educational efforts. However, an enhanced interaction with SME’s will be a crucial factor, in order to improve the productivity and the added value of products and services generated in the Region of Western Macedonia. Some of its more famous products are marbles, Saffron (krokos Kozanis), fruits, Florina peppers, local wines (Kozani, Amyntaio), furs (Kastoria, Siatista) and specialized arts and crafts industry. The Egnatia motorway via Egnatia (Trans – European Network) that crosses the Region, along with its two vertical National Roads, form a network that dramatically improves the transport conditions in the Region and alter its traditional “isolation” image, mainly due to its mountainous landscape. On the other hand, the railroad network is insufficient and the two airports (Kozani and Kastoria) can only serve small passenger planes. The telecommunication network has dramatically improved over the last decade, providing the regional population with adequate services and modern facilities. The last years the region is being developed in tourism mainly on winter. It is the only Greek region without sea coast, but on the other side there are a lot of lakes, mountains, picturesque villages and two big ski centers in Florina (Vigla) and Grevena (Vasilitsa) and one other under construction in Kozani (Velvendos). The administrative building of Western Macedonia region is located in Zone of Alternate Urban Planning (ZEP) in the city of Kozani. The unemployment rate stood at 29.1% in 2017. As of 2017 the Region has the highest regional unemployment rate in the European Union. 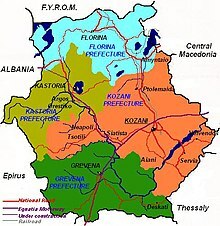 As one of thirteen administrative regions, the Western Macedonia Region (Greek: Περιφέρεια Δυτικής Μακεδονίας, Periféria Dytikís Makedonías) was established in 1987, comprising the prefectures of Kastoria, Grevena, Kozani and Florina. In the absence of a working budget the administrative regions however remained unable to fulfill even their limited responsibilities, until in 1994 they assumed the prefectures' competences in regard to tax collection, European structural funding and treasury. Resulting from the 2010 Kallikratis Programme, prefectures were abolished and instead, the regions became self-governing bodies in their own right with powers and authority being redefined and largely extended. Starting with the 2010 local elections, both the regional governor and the regional council have been popularly elected. From 2014 on, the elections are held together with the European Parliament elections for a five-year period. Current regional governor is independent politician Theodoros Karypidis who beat incumbent Konstantinos Dakis of the New Democracy party in the 2nd round of the 2014 election. The region is based at Kozani and is divided into four regional units (the pre-Kallikratis prefectures). It comprises 12 municipalities (down from 61 pre-Kallikratis local administrative units). Along with the neighboring Epirus region it is supervised by the Ioannina-based Decentralized Administration of Epirus and Western Macedonia. The population of Western Macedonia was 283,689 according to the 2011 census. Today, the region has a mixed population of Greeks and Slavophone Greeks. The former are mainly concentrated in the towns Florina, Kastoria and Ptolemaida. There are also around 1,400 Slavophones—approximately 0.5% of the local population—who profess an ethnic Macedonian identity. Other smaller communities include Aromanians and Arvanites. The lake Orestiada in Kastoria. Neoclassical houses at the shoreline of Sakoulevas river, Florina. Georgios Lassanis mansion in Kozani. The University of Western Macedonia provides technical education to stimulate growth throughout the region, and is located in Kozani and Florina. Popular programs at the University in Florina include courses of study in the Pedagogic Department and the Department of Balkan studies. The Technological Educational Institute of Western Macedonia (TEIWM) provides undergraduate degrees in Engineering, Business and Finance, Agriculture, Health and Welfare. Based in Kozani, it operates satellite campuses in Kastoria, Florina, Grevena and Ptolemaida. ^ "Demographic and social characteristics of the Resident Population of Greece according to the 2011 Population - Housing Census revision of 20/3/2014" (PDF). Hellenic Statistical Authority. 12 September 2014. ^ Vamvakas, Nancy (2012). Europeanizing Greece: The Effects of Ten Years of EU Structural Funds, 1989-1999. University of Toronto Press. pp. 26–29. ISBN 978-1-4426-4141-9. ^ OECD (2014). "Greece". OECD Regional Outlook 2014 Regions and Cities: Where Policies and People Meet. OECD Publishing. p. 242. doi:10.1787/9789264201425-en. ISBN 978-92-64-20140-8. ^ Roudometof, Victor (2002). Collective Memory, National Identity, and Ethnic Conflict: Greece, Bulgaria, and the Macedonian Question. Greenwood Publishing Group. p. 124. ISBN 0-275-97648-3. ^ In the 2014 European elections in Greece, 1,441 people from Western Macedonia voted for the Rainbow Party, which represents what it regards as the ethnic Macedonian minority in Greece. Wikimedia Commons has media related to West Macedonia.